Reporting to the Ring Director of Education and Curator of Public Practice, this individual will coordinate all aspects of SITE’s Public Programs in the Education Department as well as coordination of all travel and accommodations for presenters coming to Santa Fe. Job responsibilities include: communicating with the presenters; preparing, sending and receiving of letters of agreement; compiling text and images for the printed newsletter and for press; assisting and preparing presenter media such as PowerPoint or videos; coordinating with videographer and staffing for programs; and accommodating any needs required for public programs. 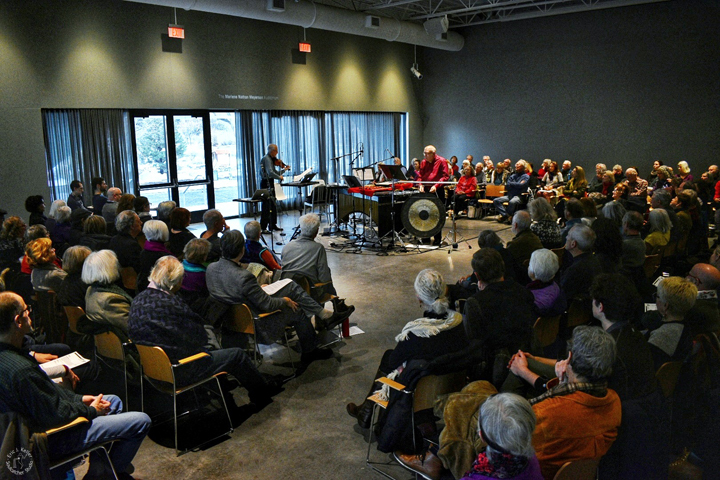 SITE’s Public Programs Coordinator will work with SITE’s Visitor Services Associate to manage the will call list and ticketing for each event and must be present at each public program. The person in this position will also assist with outreach and promotion of SITE public programs and will work with SITE’s External Affairs department and Digital Media Assistant to promote the events on social media and through email. SITE is looking for someone who is detail oriented, flexible, and charismatic. We are looking for a diverse range of candidates with unique backgrounds, skills, and experiences. Computer skills are a must (many presenters need assistance with the media for their presentations). A/V experience is a plus. Evening and weekend hours are required. Please send a resume and cover letter to lefrak@sitesantafe.org by April 8, 2019. No phone calls. SITE Santa Fe offers dynamic opportunities for young students and professionals to gain valuable skills relevant to today’s museum careers. Internship applications are accepted for Spring, Fall, and Summer terms in the following areas: Exhibitions and Curatorial, Events and Development, External Affairs, Digital Media, and Education and Outreach. In addition to the projects and training received in specific departments, interns are provided with many educational opportunities throughout the program. For each term, interns are scheduled to meet with senior staff members from each department. These meetings are informal opportunities for the interns to learn about how each department functions as well as the diverse career paths taken by SITE’s staff. Interns are also given opportunities to engage with other interns and organizations in Santa Fe and the surrounding area. This spring, four interns will be accepted in to one of each of the following departments: Education & Public Programs; Development & Events; External Affairs & Digital Media; or Exhibitions & Curatorial. Interns will be required to work a minimum of 180 hours (or 15 hours/week for 12 weeks) starting as early as mid-May through August. Each intern will receive a $1000 stipend ($500 at the midpoint and $500 at the completion of the internship). 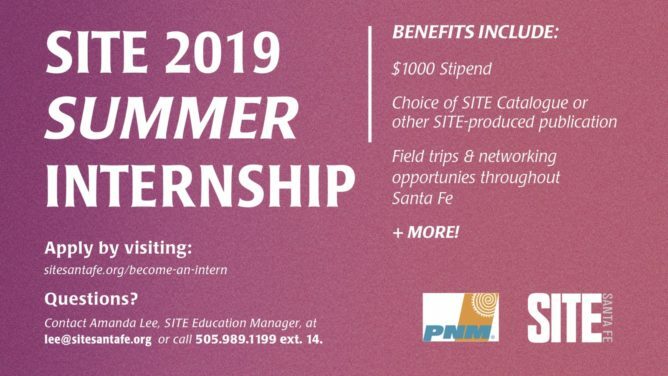 Internship stipends issued by SITE Santa Fe are not considered salary or meant as compensation, but are awarded to help defray living expenses for an intern during the term of their appointment. To apply follow this link. Applications for Summer 2019 will be accepted through April 15, 2019. Inquiries may be directed to Amanda Lee, Education Coordinator, at lee@sitesantafe.org or 505.989.1199, ext.14. o learn more about our current internship program, click here.